Serve with crusty, grainy bread. Continue reading for recipe! Heat oil in the bottom of a medium soup pot. Add sliced onion and rosemary and saute 3-5 minutes or until translucent and rosemary is fragrant. Add crushed garlic during the final minute. Add chicken broth and beans. Bring to a gentle boil. Remove from from heat. 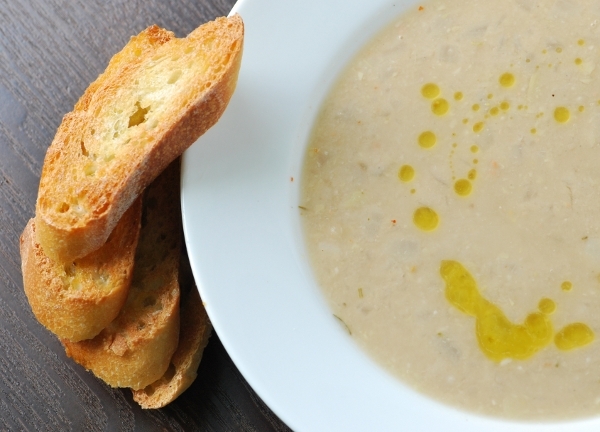 Let soup cool until room temperature or lukewarm. When sufficiently cooled, puree soup by 1/2 cup fulls until smooth. Soup will be thick. Or, if you have a hand blender, leave the soup in the pot and directly puree. Thin with water to reach desired consistency. I liked mine on the thicker side to dip bread in. To heat, warm soup in pot over medium heat. Garnish with sprigs of rosemary if desired. Add salt and pepper to taste. Serve with thick, grainy country bread. * I found that the first time I made this soup, it was overly salty due to the sodium from the canned beans and chicken stock. If you choose to use regular canned beans, make the chicken broth sodium free and vice versa.